Whenever you start looking for a locksmith, you want to look for a company with experience. 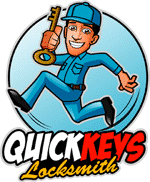 What would you say if we told you that at Quick Keys – Locksmith we have over a decade in business experience in the region? Our 24/7 emergency services also utilize a fully loaded van in order to provide a 20 minute response time. We make sure that every employee that we hire has the proper training for the job, and that they are dependable, reliable, and honest, so you can have peace of mind every time you give us a call. What Does Our Locksmith Service Offer? When you call a locksmith you want to know that you’re getting services that matter, right? Your local locksmith should be able to take care of everything that you need and more! We have devoted ourselves to making sure that we can have locksmiths of all sorts, including ones that can take care of issues related to auto, emergency, and commercial purposes. So, the next time that you need a locksmith give us a call and you will find that we are the best one stop place for locksmith needs. We all want to know that there is a local locksmith nearby that has our best in mind. That’s what our locksmith company wants to be for you. We are your local locksmith, always putting your needs first and helping you to get what works best for your home, business, or auto needs. By working with a locksmith from our company, you can be sure that there is always a locksmith near me that is helpful, ready, and available to come to you and get any need, emergency or not, worked out.